Both resveratrol and grape seed extract act as powerful antioxidants in the body. Antioxidants combat free radicals, which can attack and kill your body's cells, as well as damage cell DNA. Antioxidants also play a role in certain medical conditions like heart disease and cancer, as well as in aging. 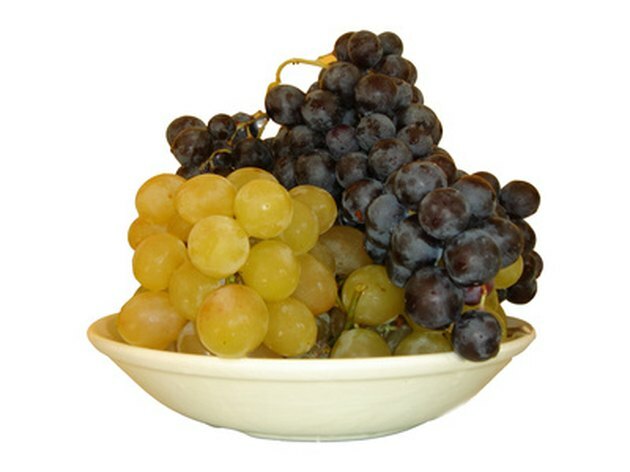 The antioxidant actions in grape seed extract are attributed to the constituents known as oligomerica proanthocyanidin complexes, or OPCs, while resveratrol itself is a constituent of grape skins that bears the antioxidant effects. Additionally, resveratrol is considered a phytoestrogen, which is a plant-based substance that acts in a similar way to the estrogen hormone in your body. Due to its antioxidant and estrogen-like actions in the body, resveratrol is sometimes used to treat heart disease and prevent cancer. Grape seed extract's antioxidant actions account for its potential use in treating chronic venous insufficiency, high cholesterol, edema and hypertension, as well as in preventing cancer, according to the University of Maryland Medical Center. Grape seed extract is also sometimes recommended for treating diabetes, hemorrhoids and poor night vision, and for skin anti-aging purposes. Additionally, grape seed may help treat burns, atherosclerosis, constipation and other gastrointestinal conditions, as well as promote wound healing, according to the Memorial Sloan-Kettering Cancer Center. No widely accepted, conclusive scientific research supports the use of resveratrol or grape seed extract to prevent or treat any medical condition, however. A typical dose of resveratrol is 500 mg per day, according to the University of Pittsburgh Medical Center. For grape seed extract, a daily dosage of 200 to 400 mg is used to treat edema and 150 to 300 mg to treat chronic venous insufficiency, notes the University of Maryland Medical Center. You could take 25 to 150 mg of grape seed extract up to three times daily for general antioxidant effects. Grape seed extract is usually standardized to contain 40 to 80 percent proanthocyanidins. Ask your physician about the dosage that's right for you before taking grape seed extract or resveratrol. Resveratrol's estrogenic effects could potentially increase the growth of breast cancer cells, making the remedy unsafe for women who have or are at risk of having estrogen-sensitive types of cancer, warns the University of Pittsburgh Medical Center. Grape seed extract may offer blood-thinning effects, making the remedy possibly unsafe if you're also taking anticoagulant drugs like Coumadin, warns the Memorial Sloan-Kettering Cancer Center. The same is true if you have a bleeding disorder like hemophilia, notes the University of Maryland Medical Center.